Cold hardy ginger plants produce stunning bunches of flowers which butterflies flock to! Many gingers of the Hedychium genus are cold hardy to Zone 7 as long as they are properly winterized. Gingers grow up to 7 foot tall and will require support if you want the stalks to remain vertical. The leaves are well spaced and remind me a little of corn in their arrangement. They may be adorned with leaves that are narrow or wide, or even variegated depending on the variety. Blooming begins in mid summer, with the flowers being produced in a cluster at the top of the stalk. 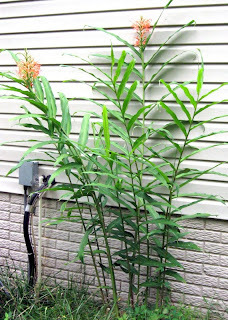 Ginger rhizomes should be planted shallow with compost added. New shoots should start popping up soon after planting, but don't be surprised if it takes a year for the plant to produce its first flower if the rhizome cutting and attached stalk was small. Once fully established, gingers have moderate water and fertilizer needs, much less than the thirsty bananas and cannas. Winterizing is very important in Zone 7, in colder zones I would dig up the rhizome and store it inside in a pot of soil until spring. 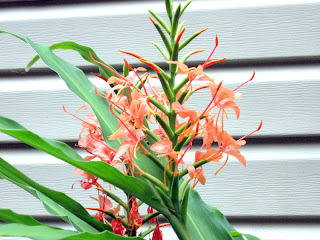 Two years ago I started an orange bottle brush ginger (Hedychium coccineum) from a small rhizome cutting. This particular ginger is not often recommended for Zone 7, but I've "cheated" a little and placed the plant on the most sheltered side of my house right next to the foundation, which keeps it a little warmer during the coldest nights. If you are looking to add a little height (and butterflies!) to your garden, give gingers a try! Just love the colour of the flower on your ginger ... well done on your efforts to get this growing ... it's looking so happy and healthy. True - ginger leaves looks like that of the corn leaves. I ike the color of its flowers.